For the past few weeks my Instagram feed has been inundated with hearts, hearts, and more hearts. Which can only mean one thing: Valentine’s Day must be right around the corner. I ultimately caved, reluctantly happily stopped scoffing, and decided to jump on the Valentine bandwagon last minute. 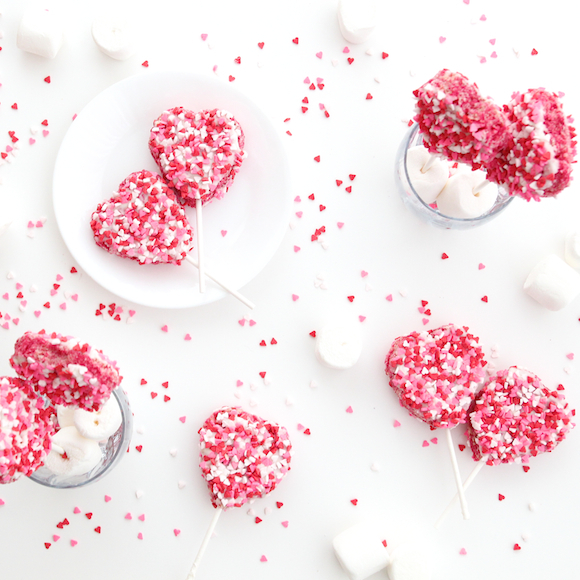 And what speaks to my heart more than cute, little heart-shaped sweets? 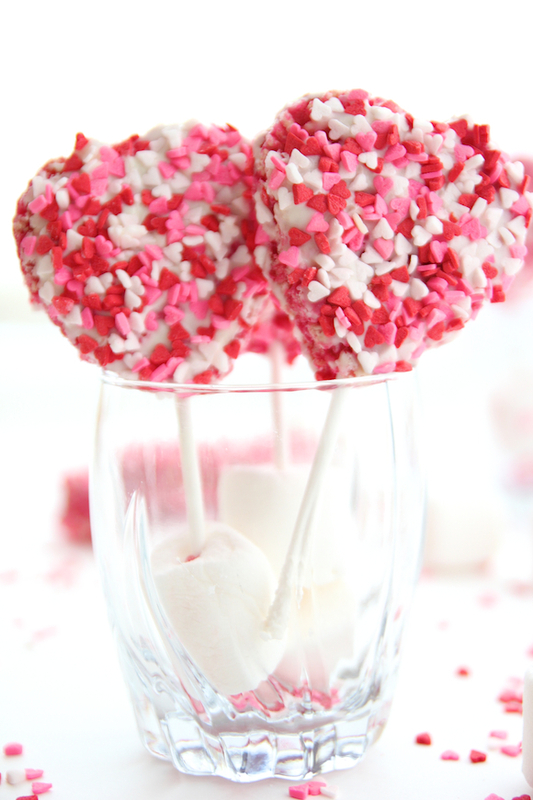 These Rice Krispie lollipop hearts are the perfect last minute treat that’s fun, easy to make, and oh-so-adorable. Whether for that special someone or your best girlfriends, these tasty little treats will show anyone just how much you care. Place butter and marshmallows in a very large bowl and heat on high in the microwave for 2 minutes. Remove, stir, and heat for another 2 minutes. 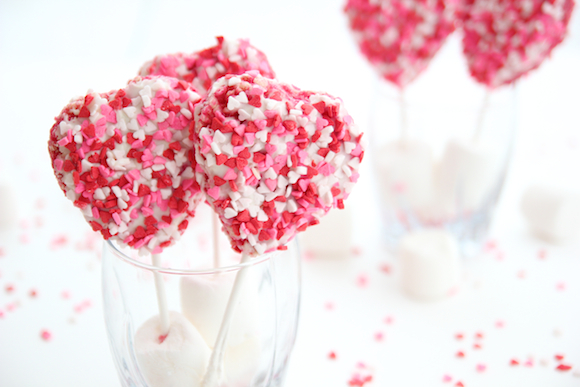 Remove from microwave and stir well with a spatula until marshmallows and butter are fully combined. Add food coloring to the mixture and mix well. Stir in Rice Krispies and quickly mix until fully combined. On a baking sheet lined with wax paper, spread the Rice Krispie mixture on, about 9x13x½ inch thick. Let cool slightly, then cut out heart shapes with a cookie cutter and set aside. Place the sprinkles in a wide flat bowl and set aside. Place the candy melts in a bowl and heat in the microwave for 1 minute at 50% power or defrost setting. Remove, stir, then place back in microwave and heat for another minute at 50% power or defrost setting. Stir well until completely melted. 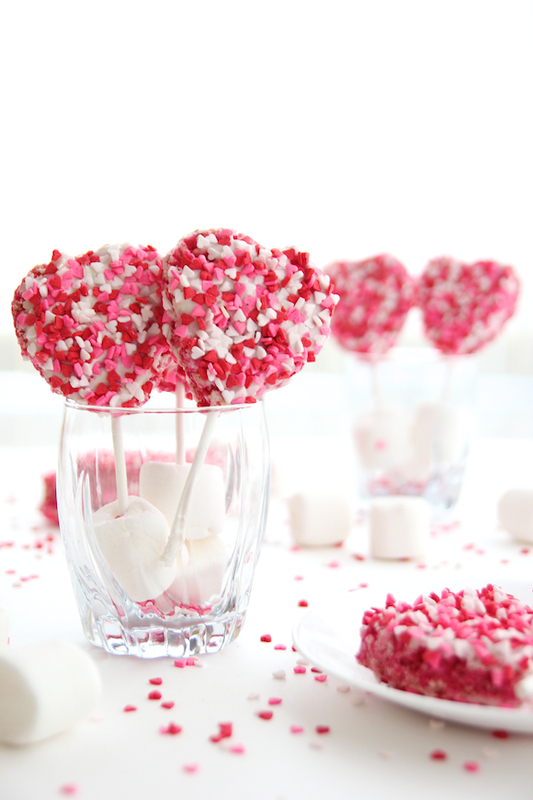 Dunk the Rice Krispie hearts in the melted candy melts, coating a thin layer on both sides. Use a knife to spread the coating evenly. 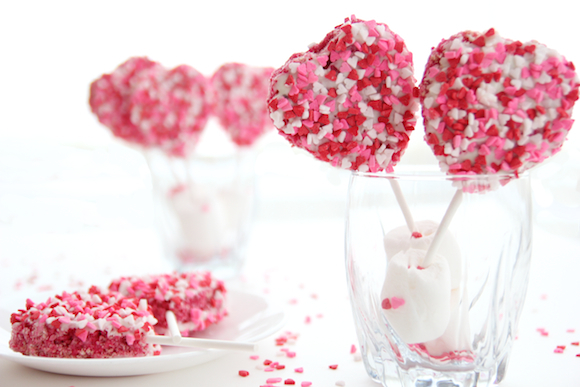 Coat the hearts generously with the sprinkles on both sides. Insert lollipop sticks in the bottom of each heart.